Hi! My name is Gilley. I've been with the K-9 Angels for a while now and even though I love my foster family I hate coming back to the adoption center every weekend. It's so loud with a lot going on. That's why I'm so fussy! I'd really like to be in my new home already. That's why I'm looking for my very own family. Give give me a chance to show that I'm a perfect companion. I am calm in nature but on my occasional burst of energy, I like to take walks. So you can show me off around the neighborhood or local parks because I'm leashed trained. I also don't hate baths, there's not many of us out there. I'm potty trained. I'm not destructive so I do not chew on shoes or furniture. I'm also cute because I get plenty of beauty rest. But I'd say my biggest strength is being a certified cuddler. Oh and I love to wear cozy sweaters and onesies, my foster mom has spoiled me to the good life. She's leaving something special for me and my potential adopters, keep an eye out for it. So listen, if you've had a good day, I'll make it better. If you've had a bad day and need a little pick me up, then pick me up. I will love you forever! 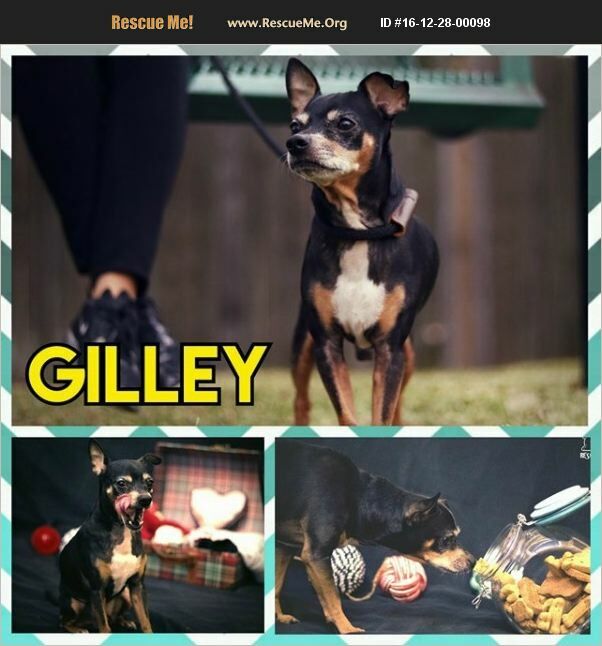 Gilley is a Male Chihuahua Mix that we estimate to be born around 12/20/2011. PUPPIES: Young puppies that have not had their second round of puppy shots will not be at the Adoption Center for our weekend adoption events. If you are interested in adopting a puppy, please fill out an application on our website http://www.k-9angelsrescue.org/k9_angels_rescue_adoption_process.html. If your application is approved, a meeting can be arranged. Also, we only adopt young puppies locally due to the 4 month time frame it takes to get them fully vetted and altered. OUT OF STATE ADOPTIONS: We do allow out-of-state adoptions for dogs, however, the adopter MUST come to Houston to get the dog and take the dog home with them. We do not allow our dogs to be shipped. Also, our puppies can only be adopted to the immediate Houston vicinity as it takes 4 months to get them completely vetted at our vet here in Houston. We will not allow our dogs/puppies to be adopted out of the area without being spayed/neutered. We spay/neuter puppies at 4 months old. SPAY/NEUTER: As we believe proper healthcare of one's pet is a requirement of good ownership K-9 Angels Rescue only adopts out dogs that have been fully vetted. If the dog being adopted is not already altered at the time of their adoption, the dog will be altered within 2 weeks of adoption at our vet at our cost, with the exception of puppies which will be altered as soon as the puppy is ready. NOTE: All dogs are officially the property of K-9 Angels Rescue until they are altered by our veterinarian. Please LIKE and share our Facebook page: www.facebook.com/k9angelsrescue.